I’ve always been rather indifferent to these types of things. Sure, I’ll enjoy them here and there but didn’t really give them much thought. Then one night while working in a rather fancy pants restaurant, I was charged with making the spiced nuts we sometimes put out in the bar. A big mess of assorted nuts was tossed with honey, sugar, salt, pepper and various spices then toasted in the oven. While they were on the speedrack cooling, I couldn’t stop picking. A snack here, a nibble there. I was well on my way to eating the whole sheet pan that night and it changed the way I thought about spiced nuts. I quickly changed my nightly snack from the Marcona almond/dried cherry combo I’d grab in dry storage to this. After I left that job, I quickly realized I’d have to make them on my own, on a much smaller scale of course. I’ve discovered a combination of honey and sugar works best as the sugar helps the mixture caramelize and harden upon cooling, making for a neater nut. For a spicy combo, I use a mixture of chile powders – cayenne for heat, chipotle for a nice smokiness – plus black pepper for a little kick. Oh and definitely salt – sea salt is nice but kosher works too. Everything needs a little salt to brighten and elevate the flavor. For nuts, you can use whatever you like; I particularly like pecans so I typically stick to those, but we used to mix 5 or 6 different kinds at the restaurant. Toss your nut ‘o choice with the honey/sugar/spice goop and pour the mixture on a Silpat lined sheet pan. Now here’s the thing – Silpats will make your life much easier. If you don’t have at least one by now, just go ahead and make the leap. I suppose you could use parchment or even oil the pan very lightly but a silicone baking liner is ridiculously easy. I should also probably mention that these don’t do too well in humidity unless you stockpile those little desiccant packets from your beef jerky. And if you do, well then … bravo. Stick the pan in the oven for 10 minutes; the mixture will become loose and bubbly. Give it a stir. Bake 5 minutes; stir; then 5 minutes more. As the nuts cool, separate them with a fork to break up any big clumps. If you wait until they cool, you’ll likely be snapping the clumps in half. Not as pretty but they’ll taste the same. Your call. These are delicious, and I mean stinkin’ delicious, all on their own or they’re pretty fantastic tossed in a salad too. 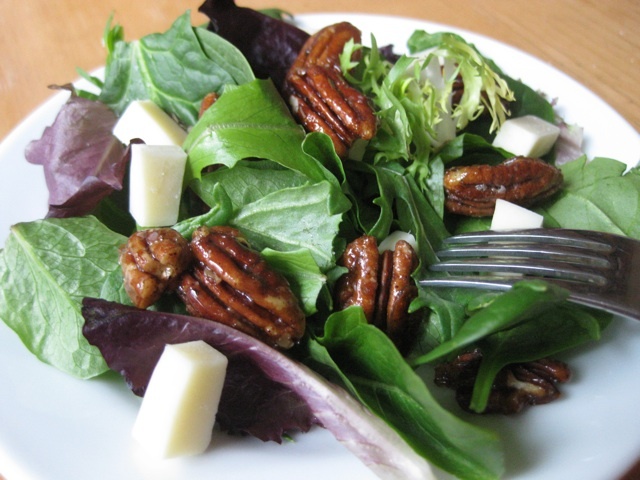 Mixed greens, a simple vinaigrette, goat cheese and spiced pecans? Shut up. Feel free to vary up the spices as well – keep the sugar/honey amounts the same but change up the spices. Use cumin, curry and garam masala for a little Indian twist. How about cumin, cayenne and pepper for a south of the border flair? Or go sweet with cinnamon, ginger and a pinch of nutmeg. Asian? How about 5-spice, ginger and black pepper? Don’t forget the salt – even a sweet mixture needs a little salt. STRESS BAKING THERAPY FACTOR: OH HELL YEAH. You will go nuts over these. (Collective groan. Sorry.) Get that spicy/salty/sweet balance right – and it’s not difficult – and you will be so very proud. A great feeling of accomplish will envelop you like a warm blanket. Ho boy, are these tasty. Having a Superbowl party? A little bowl, set out discreetly over there, will be gone in no time. And I wasn’t kidding about how good these are in a salad. Since I’ve pretty much decided that lettuce is useless, I need lots of good stuff with my greens and these certainly fit the bill. Did I mention how addictive they are? Be proactive and make a double batch. You’ll thank me later. As mentioned above, vary up the spice any way you wish. Make a few, differently spiced versions just for kicks. Preheat oven to 325°F if you haven’t already. Line a sheet pan with a Silpat mat (preferable), parchment paper or lightly oil the pan. In a large bowl, combine the honey, sugar, salt, pepper, cayenne and chipotle. Stir to blend. Transfer to prepared sheet pan. Remove from the oven and stir the nuts to coat with melted spice mixture. Continue baking 5 minutes, then stir again. 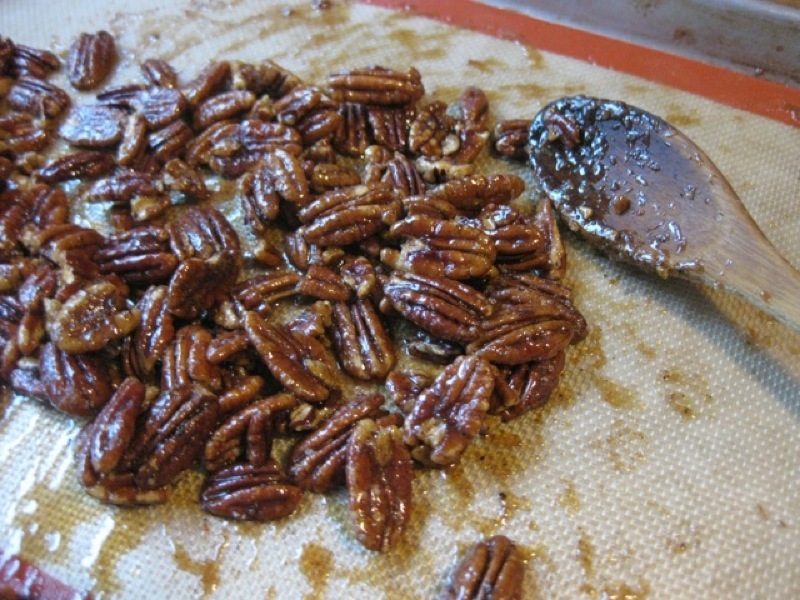 Continue baking another 5 minutes until pecans are golden and the coating bubbles. Remove from the oven and place the hot sheet pan on a wire rack. While hot, separate any clumps with two forks. Cool completely. Do-ahead: Can be made 3 days ahead. Store airtight at room temperature. I love pecans with any type of coating, but I’ve never tried a combination coating like this! I usually stick with cinnamon, sugar and nutmeg, but I’m really curious how the hot spices add to the flavor. I may have to try these soon! Wilma makes a similar concoction. I’ll her her try your recipe. OOPS…I meant “I’ll have her try your recipe”. OK..this is a must-try. 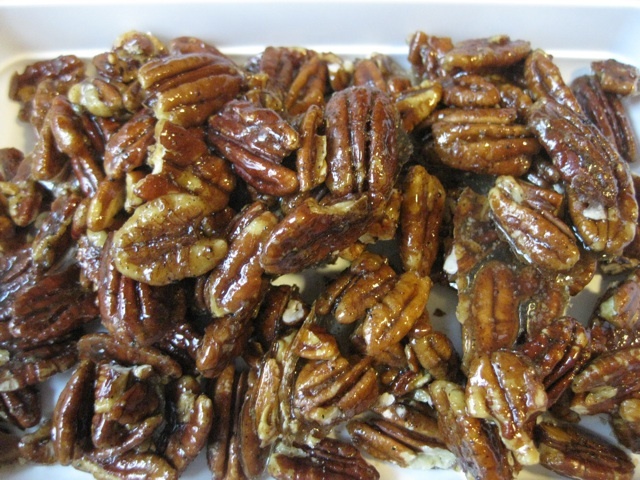 Love pecans so getting them all nice and spicey is making my mouth water. And who doesn’t love nice crunchy bits in their salad! The asian version would be killer on cashews.